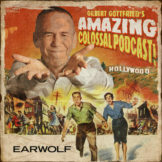 Gilbert and Frank sit down with another sought-after guest, Tony-nominated actor-director Austin Pendleton, for an entertaining conversation about the randomness of success, the myth of comic timing, the plight of character actors and the secret of surviving in a business without rules. Also, Austin directs Elizabeth Taylor, replaces Dustin Hoffman, turns down Robert Altman and shares the screen with Jackie Gleason, Jack Lemmon, Paul Newman and Barbra Streisand (to name a few). PLUS: “The Muppet Movie”! The wisdom of Otto Preminger! The diplomacy of Billy Wilder! Groucho ad-libs! Orson Welles disses Stanley Kubrick! And Austin remembers the late, great Philip Seymour Hoffman!